Description: It is a delicate climber with shining purplish-red branches. Stem and leaves are fleshy. The plant bears small white or red flowers. The fruits are of the size of pea and turn white or black on ripening. Fleshy leaves are also used as vegetable. How to Grow: One or two plants of this important pot-herb are adequate per household from primary health care point of view. Being weak-stemmed, it needs to be provided support for climbing. It can be planted in the ground or in pots of the size 20-25 cm. It can also be planted in hanging baskets and its purplish dropping branches add a pleasant hue to the surroundings. Care regime: This plant needs only little care for its maintenance. Watering two-three times a week is adequate for its optimum growth. Excessive watering may result in decay of this plant. 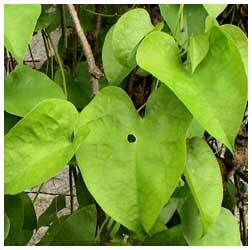 The plant can sustain partial shade for a few days and needs to be periodically provided direct sunlight for its good growth. Collection: Use a sharp knife to cut the required quantity of aerial parts from a well established plant. New shoots keep on sprouting all through the year.